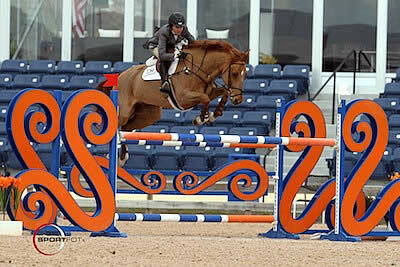 Wellington, FL – January 14, 2010 – Speed was the order of the day in the $6,000 Spy Coast Farm 1.40m Speed Challenge class at the 2011 FTI Winter Equestrian Festival (WEF). Laura Chapot of Neshanic Station, NJ and her trusty partner Bradberry took the blue ribbon in the last class in the International Arena. Held at the Palm Beach International Equestrian Center in Wellington, FL, the 2011 WEF will host 12 consecutive weeks of competition through April 3, 2011. Course designer Anthony D’Ambrosio of Red Hook, NY, set the track for today’s class. There were 21 entries, and seven of those were able to keep all of the jumps up. Riding out of the ninth spot in the order, Chapot and Bradberry were chasing a very fast time set by Shane Sweetnam (IRL) and Belle Blue S, owned by Jerry and Maria Sweetnam and Spy Coast Farm LLC. They stopped the timers in 68.820 seconds. Chapot and Bradberry were able to shave just enough time off the clock to move into the lead in 68.013 seconds. No one else in the class would be able to catch her time. Third place went to Juan Jose Bancalari (MEX) on Villeneuve, who was clear in 70.885 seconds. 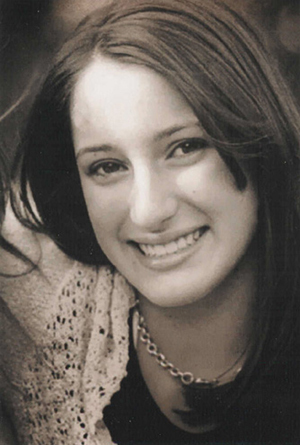 Guest: Jessica Springsteen: A rising star in the sport who is breaking onto the Grand Prix Circuit at the Winter Equestrian Festival. Nick Skelton and Unique won the $8,000 G&C Farm 1.45m Jumpers on the opening day of the 2011 FTI Winter Equestrian Festival. Photos © Sportfot, Official Sport Photographer of the FTI Winter Equestrian Festival, www.sportfot.com. 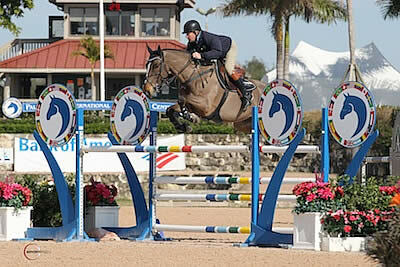 Wellington, FL – January 12, 2011 – The 2011 FTI Winter Equestrian Festival (WEF) began its competition today with opening jumper classes in the International Arena. To start the year off right, Nick Skelton (GBR) was back in the saddle and in the winner’s circle with Unique, owned by Beverly Widdowson, in the $8,000 G&C Farm 1.45m Jumpers. 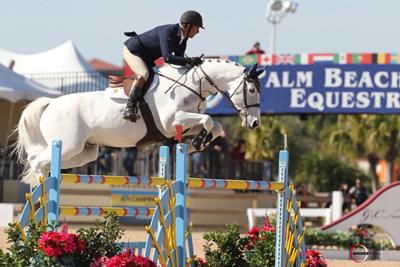 The first week of the FTI WEF runs through Sunday, January 16. 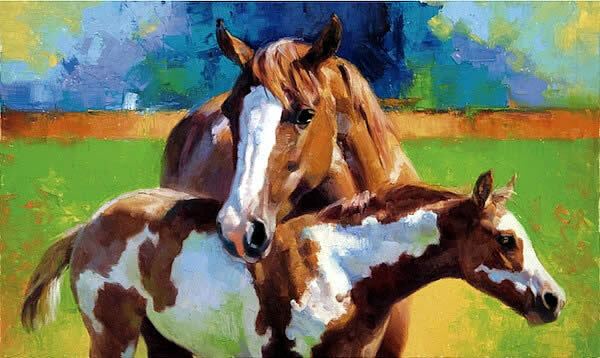 The 2011 FTI Winter Equestrian Festival has 12 weeks of competition that conclude on April 3, 2011, and they will be awarding almost $6 million in prize money through the circuit. 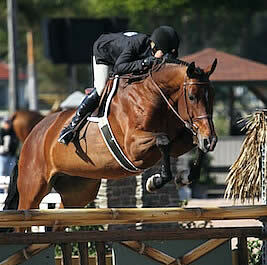 The highlight jumper class in week one is the $30,000 Speed Derby on Sunday at 2 p.m. This week’s course designer in the International Arena is Anthony D’Ambrosio of Red Hook, NY. He set a welcoming course for the 12 entries in the Time First Round class. The early leader was Pablo Barrios (VEN) who was clear on G&C Sinatra. They set a time of 69.682 seconds that would hold up for fourth place. Barrios placed third on his second mount, G&C Flash, who went in 67.614 seconds. Enrique Gonzales (MEX) improved on that time in 66.744 seconds with his horse Katina, and they finished second. News: 2011 George H. Morris Horsemastership Training Session is available here. Wellington, FL (December 30, 2010) – Riders who put their best foot forward each week during the world class 2011 FTI Winter Equestrian Festival will have the chance to ride away with the “Put Your Best Foot Forward” Award. Sponsored by Draper Equine Therapy, makers of therapeutic horse and rider products featuring the innovative “smart fiber” textile Celliant, each winner will receive a pair of Draper Equine Therapy Recovery Wraps, an Anti-Sweat Sheet and Saddle Pad for their horse, along with a pair of Draper Body Therapy Socks and a t-shirt for themselves.